It seems that any time there is left-over salmon, it doesn’t get eaten as quickly as other things. Sometimes I’ll add some pieces to a plate of salad greens with olives, cucumber and tomatoes for a nice lunch, and I like that. But overall, there’s just something about left-over salmon – it stays in the fridge, uneaten. Salmon patties are the answer. Plus you can mix and match the ingredients, and how you serve them (on their own, in a pita, alongside a grain salad). The more efficient way to do this is to use leftover salmon and potatoes. It’s best to plan for salmon twice in a week: buy a large piece for dinner the first night and only eat half. Also make potatoes for one of your meals early in the week and save a couple for this dish. Then, these patties come together quickly with the pre-planned leftovers. Scoop 8 patties onto a parchment-lined baking sheet and bake at 4oo for 10 minutes. 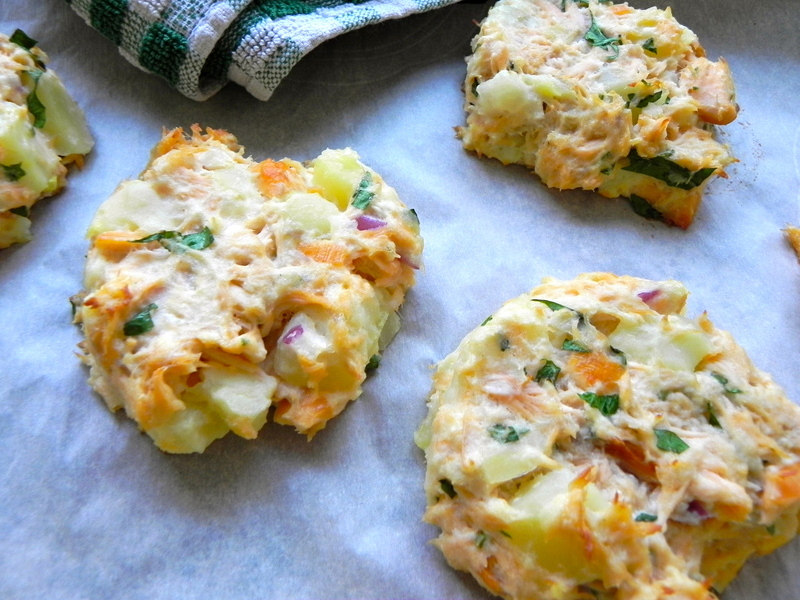 These turn out like small salmon burgers, or large baked crab cakes. Or like salmon patties. Try them with different flavourings, too: add ground cumin /chopped cilantro / lime, or curry powder / diced chilies. Serve them with a yogurt sauce, sliced tomatoes or lemon wedges for squeezing. It all depends on how you want them. Maybe in a pita with a heap of alfalfa sprouts and some sweet mustard? Thanks so much; I hope you try them. I love turning leftovers into something new- it makes them so much more appealing! Thanks for sharing at ‘Tell em Tuesday’! So funny because I can’t tell you how long I’ve been thinking about making salmon patties/cakes! I bake or broil salmon all the time and I guess I want to do something different but it’s never happened! These look great and love the potatoes…easy, too, which is what I want! Thanks for visiting and leaving a comment. I hope these work out for you as well as they have for me. hi, i’ll be posting my meatless patties soon and i would like to include yours as one of the other options for meatless patties and i would like to request for your permission to include your photo in my post that i will use to link back to your recipe. Yes, thanks. Please share your blog address, here. Happy Sunday to you, here’s the link of the blog post I made including your recipe. Thank you! Love the list of simple, clean ingredients. This looks great! Thanks, I’m glad you like it. Let me know if you try it!